The American Relief Coalition for Syria (ARCS) is a coalition of 20 American relief and humanitarian organizations dedicated to providing aid and development programs to millions of Syrians- living both inside Syria and as refugees in host countries. In March 2013, 14 relief organizations, many of them Syrian American led, formed the American Relief Coalition for Syria- a collaborative partnership to coordinate efforts, promote best practices and humanitarian principles, increase public awareness of the gravity of the Syrian crisis, and advocate cooperatively towards more sensible humanitarian policies for Syria at national and global levels. In 2013, ARCS collectively raised millions of dollars dedicated to aid for Syrians. The funds were distributed across Syria and in refugee camps delivering medical aid, equipment to field hospitals, school supplies, thousands of tons of heating fuel, food baskets for thousands of internally displaced families, tens of thousands of winter packages of blankets and clothes for Syrian families, and monthly supplies of infant formula. In the medical field, ARCS members have established over 52 field hospitals and medical points, supported 14 advanced medical centers and 65 trauma care facilities, provided free dialysis treatment, sustained primary care, spearheaded vaccination campaigns, delivered dental services, and shipped $6.5 million worth of medical equipment and supplies. By pooling the talents and expertise of hundreds of professionals, ARCS members cover all fields of aid and development including: food & clothing programs, shelter, medical aid, education, women’s development programs, refugee assistance, psychosocial programs, camp management, and sustainable giving programs. ARCS members have developed a trusted network of on-the-ground partners in Syria, thus securing cross-border and cross-line operations that expand aid deliveries to areas that international organizations cannot reach. ARCS also partners with national and international NGOs to develop their programs, increase efficiency, and broaden outreach. In addition to providing basic necessities, ARCS members currently focus on development projects that promote sustainable giving such as flour mills, bakeries, and women’s workshop centers. ARCS members are also committed to education and psychosocial development for Syrian children by developing creative mentorship programs for refugee children and sponsoring schools both inside and outside Syria. Visit the ARCS website for more information! 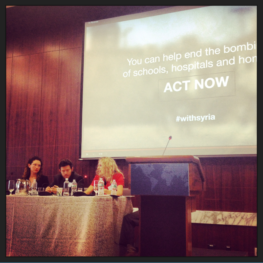 On September 26 & 27, SAMS helped to host the American Relief Coalition for Syria (ARCS) Fall 2014 Annual Conference. The focus of the conference was Enduring Emergency & Providing a Dynamic Response in Syria and was held at the Center for Strategic and International Studies (CSIS) in Washington, DC. Representatives from 13 organizations from ARCS were in attendance. Topics included refugee resettlement, advocacy and public engagement shaping the narrative around Syria, potential funding opportunities for humanitarian work, and how to work with Homeland Security facilitate our work.